I got my first microcomputer at the age of thirteen (1984), it was a Thomson MO5 with 48Kb of memory, no floppy drive, no hard disk, just a tape recorder. MO5 was a 6809 based computer. It was plugged on my TV. The only progamming language available was the Basic and we had to type pages of lines of code (published in specialized magazines (Hebdogiciel)) in order to create and play very basic games! My second computer (1987) was a Commodore Amiga 500. 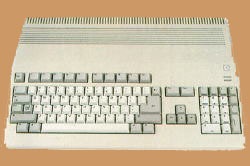 The Amiga 500 is a 68000 based computer running at 7,14Mhz - 16/32Bits with 512 KoRAM and 512 KoROM. Big improvement this computer had a mouse and an integrated floppy drive 3"1/2 880 Ko and amazing multimedia capabilities. Later on (1991) I got my first PC, a 8086. This one still didn't have a hard disk and was working under the DOS operating system. A step back compare to the Amiga! So I decided to keep the Amiga too. My next computer (1993) was a PC 386 at 60Mhz with a hard drive of 20Mb and 4Mb of memory running on Windows 3.0. The first computer I got in the US (1997) was a PC Pentium running @ 160Mhz, equiped with a CDRom drive, a modem and using Windows 95. Since then I got different PC laptops equiped with Pentium processors running at hundreds of Megahertz, having hundreds of Megabytes of RAM, equipped with DVDRom, CD Burner and having Gigabytes of storage space! What's next?